Doug writes his posts primarily for me and nothing gets posted until I understand what he is saying and in his efforts to simplify things for me, he learns too. I started this blog because I thought people might enjoy learning along with us. Recently, Doug wrote Angles: Better Than Boatspeed which drew some comments from an Olympic sailor who did not agree. Doug recently asked Brett Beyer offline about his thoughts on the post. Brett didn’t agree with some aspects of Doug’s post and supplemented that there was another factor to consider, TIME (before laylines, knocks, etc.). Brett would not have tacked if he were CYP. He felt CYP's only option was to wait for the inside lift to fizzle and for the wind to shift back (knock) where CYP would then be able to tack into a more favorable position. I must admit I didn’t totally understand his comments after working so hard to understand Doug’s post. But since Doug’s time with Frank Bethwaite is still a significant influence on his sailing and since Brett knew and worked with Frank as well, and even wrote the chapter on Laser trim and handling in Frank’s last book, Fast Handling Techniques, which will be available later this year, I decided to go back to the source. First, I pulled out Doug’s copy of Frank’s latest book, Higher Performance Sailing which directed me to chapters 10, 11, and 12 of High Performance Sailing with respect to persistent shifts. And there, in Doug’s book with the inscription from Frank ‘With pleasant memories of shared dreams,’ I turned to a heavily highlighted Chapter 11 with terms like angles, percentage sailing, fleet sailing [round-the-buoy racing], minimum-time sailing [ocean racing], defensive sailing, etc. Some familiar terms. It’s official, Doug has reached that age where he’s learned so much, he’s forgotten from whom he learned it. He couldn't recall Frank mentioning angles or percentage sailing. The rule is, ‘if a boat on the same tack, either ahead or behind, is pointing significantly higher than you are, or a boat on the other tack is pointing lower than expected, you must be in a header, so tack.’ The great advantage of this method is that the present pattern in your area is continuously revealed, and as well, the direction of the mean wind is constantly revealed and corrected. Use this method, always, when you are in close company, and never forget to keep looking over your shoulder, at the boats behind, particularly when you are in the lead. Hmmm… this sounds like the basis of Doug’s angles post. When close to another boat, you are either lifted or headed relative to the other boat. Doug has taken that to mean that when near another boat, he is judging his lifts and headers by the other boat and not the course or compass and he tacks accordingly. While Brett acknowledged AUS was lifted and making a relative gain, he indicated CYP might also be lifted and tacking would negate that. But Frank’s statement indicates that the angle to the other boat is telling you what the wind is in your area. Now I’m confused. 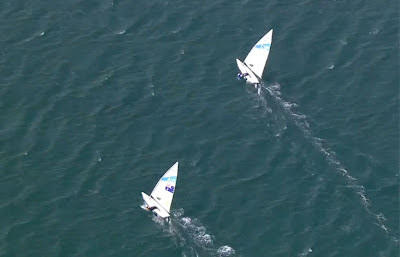 The technique above, slightly extended, is what fleet sailing is all about. When you are sailing in conditions in which there is no regular pattern this technique can be further extended to become ‘percentage sailing’. If in these conditions you elect, instead to 'minimum-time' sail, and let the backs and veers run their course and tack on the nodes, you may well sail a shorter path to the mark and finish further ahead. This is the technique of the ocean racer. But if you are sailing around the buoys and do not have the luxury of being able to wait forever for the next back or veer, and the wind direction does not behave as you expect, you may well finish further behind. 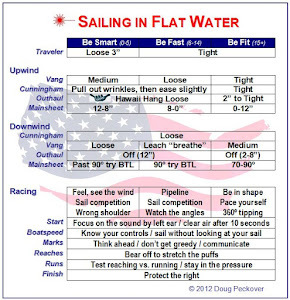 Skill in percentage sailing the fleet is no defense against minimum-time sailing, split fleets, nor on downwind legs. Percentage sailing will fail as soon as the wind shifts become regular. And then, I was totally lost. Doug’s concepts are simple for me to follow. Brett, no doubt, is a better sailor and coach than Doug. But, Brett is like a finely tuned racing machine. Put him on a small, shifty lake like Doug normally sails on and he might never have room to get out of third gear. So, maybe Doug knows a trick or two about light and shifty that Brett does not. Wasn’t Weymouth on the shifty side? Now Brett did say that he thought the angles were more significant in winds over 15 knots. 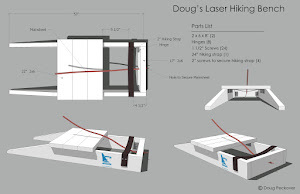 But, Doug thinks angles are more significant in light, shifty winds. Frank did say “unsteady” winds but does that mean strong gusty winds or light shifty winds. Somewhere between the three of them is the answer, but I’m not equipped to sort it out. My gut feeling is that 50% of the time Doug would be right and 50% of the time Brett would be right ... or maybe I'm 100% wrong. They're all correct in different circumstances. One of the best things about tactics and strategy in sailing is that there are rarely absolutes, rarely black and white answers to a problem. Doug and Brett's different interpretations of the Olympic medal race show that even with hindsight it's never straightforward. Having said that there are definitely guidelines to follow - the better sailors are just better at knowing when to follow them and when to ignore them. Brett is right that generally angles are more important in 15+ knots - this is because everyone is going at the same maximum hull speed even if the breeze is up and down, so relatively speaking angles become much more important. In lighter wind it tends to be more important to look for pressure as having a few extra knots of pressure can mean a big difference in boat speed. Does that mean you should ignore angles in the light stuff? Of course not, but their relative importance decreases. The best sailors will weigh everything up to decide how big a knock they should sail through to get to the extra pressure. Doug's answer the the medal race was black and white - different angles therefore CYP should tack. That's fine - if you're coaching someone newish to the sport it's better not to throw too many variables into the mix. Brett's answer was probably more of an answer for the experienced sailor - it was more nuanced and focused on the bigger picture ... Where are they on the course? Where are the other boats? What's coming next in terms of pressure? In terms of angles? All of these variables (and more) need to be thrown into the equation before the sailor decides what to do, but new sailors will just get confused if you throw all of that at them. Great answer! Doug once did a post about when to tack that took several variables into consideration and weighted their importance on the course. The variables for making decisions constantly change and, sure enough, I understood the concept but application was beyond my level and the angles worked better for me. In talking with Doug over the weekend, I now realize that even in his black and white answer, he was considering more variables than I initially realized when I read his post. You bring up an interesting point on angles being more important over 15+ knots. Doug has often said the exact opposite. I'm guessing that people from different sailing conditions get used to taking different factors into consideration. In light stuff, many a Texas sailor has sat in a hole more than once and watched the entire fleet go around them so they learn that staying in pressure is a given. Just like, I imagine in heavy weather, being in shape and hiking is a given. So after learning the givens in certain conditions, it's time to start looking for the things that could make more of a difference ... and perhaps angles is part of the answer in both light and heavy. But now I need to learn more about why in heavy air. Except that heavy usually blows me off the course and I have to learn to deal with that first. Champion of Champions need I say more. Yes ... I'm eager to see how he does. It's supposed to be light, shifty lake conditions this weekend. We all are waiting to see how he does, then again those C's are all crew work. Wow! Thanks MJ. I've only had a chance to glance but it looks like alot of great information and I can't wait to spend some time going through it. First of all, congrats to you and Doug on a very thought provoking blog. By way of introduction, I'm an Australian who has won a few state and national championships in a variety of classes, but I'm not olypic level (not enough talent). There are some very good comments on this issue already which agree with my view, but I thought I'd put my 2c in anyway. Given that each of Doug's photos are of match racing situations, I would generaly agree with the Anon Olympic sailor and Brett that CYP shouldn't tack IF HE IS GOING TO BE BEHIND AUS. This is the key point for me. Notice in each of the E6 photos, the boat to leeward looks like it would be behind if it tacked also, this is why they don't tack. I'm a huge fan of Frank B, but I think a more important rule than "tack when someone else is pointing higher", would be "cover when in front, split when behind." We've all heard that you should "stay between your opponent and the next mark", so the corollary is that when behind "don't let the leader get between you and the next mark". If you imagine a line drawn from each boat to the top mark, I would call these the "lanes" of each boat. The leading boat in a match race, should almost always be sailing towards the other boats "lane". In other words, trying to get between the other boat and the next mark. In effect, each of the windward boats in Doug's pictures is doing this (including Slingsby). The leeward boat, should nearly always be sailing so as to create more latteral leverage. Ie sailing on the tack which takes them away from the leading boats "lane". If a header comes, and it puts the leeward boat ahead, then the leeward boat should tack, and try to lock in the gain by reducing the leverage. In other words, because he is now ahead the situation is reversed and so he should sail towards the other boats "lane", rather than away. One of the great advantages of being to leeward and ahead is that generally you get to choose when to reduce the leverage (unless you get to a layline, or the other boat simultaneously tacks to stay away from you). So assuming I'm behind, what are the exceptions? When would I tack if I was the leeward boat? 1/ If I think the breeze is already as favourable as it will get and I decide to give up on overtaking the leader on this leg. It will make sense to tack back, minimise the losses, and attack the leader on the next leg. As Doug says, the square runs are great for this. 2/ If I wanted to initiate a tacking duel. This is a last resort though. If you are sailing against competant opposition, you are fairly unlikely to get past once they get between you and the mark. An exception to this was Alinghi vs ETNZ in the 2007 AC finals, where Alinghi was clearly superior tacking, and repeatedly came back at ETNZ to create a tacking duel as a way of getting past. Brad Butterworth and Terry Hutchison are two of the best, and in the 2007 AC they were on boats where they don't have to do anything except stand there and think. Interestingly, the leader almost always sails towards the other boats lane, and when he doesn't it often results in an overtake (eg Alinghy in race 2 got too cocky, and again off the line in race 3 had the lead, should have tacked to cover much sooner in my view). In that series, I got the impression that when loosing, but in the leeward posiiton with some leverage, both Brad and Terry were willing to sail just about forever waiting for a header before coming back at the leader, even if the boat to windward had the dreaded inside lift. If I was a coach, I'd be wanting my sailors to be thinking very simply, "sail towards the next shift", and "cover when in front". 2/ Choosing to sail onwards as an active decision, is just as much taking matters into your own hands as tacking is. 3/ Regarding the discussion about the relative importance of shifts in strong vs light winds. I agree with both Doug and Abe. 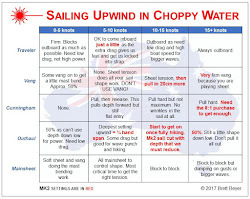 When sailing in strong breeze the boat speed wont change that much so shifts are important, but if you read what Doug said, he argues that the angle changes are much larger in light winds which I would also agree with (generally). Wow! Thank you for your comments. This is awesome! I feel like I now have coaches all over the world. You've given me some new rules of thumb to use and I'd never heard the sail toward or away from the competitors lane before. It makes sense.